W. H. E. & S.
This underprint is from the firm W. H. Everett & Son Limited. This underprint was applied to the stamps of both King Edward VII and King George V.
The underprints were applied with a hand roller invented by Everett’s and offered for sale as the “Everett” Thief-Stamp Detector for £1. The device consisted of a rubber roller on which were arranged 36 (6 x 6) underprinting dies. Because of the manner of application underprints are rarely centred very well and appear inverted as well as upright. 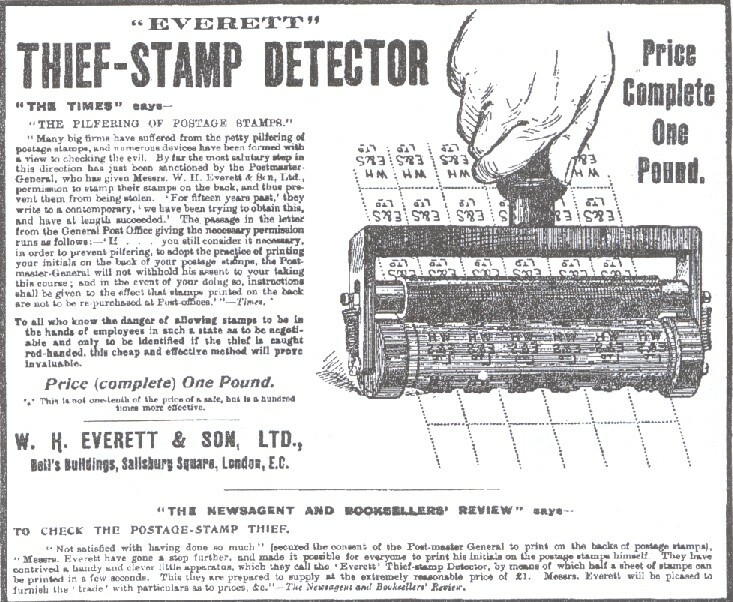 Everett advertised their roller as the Everett Thief-Stamp Detector as shown below. Note. Stanley gibbons do not distinguish between inverted and sideways varieties of this particular underprint due to the apparent random method of application. 1903. Underprint Type 1 in purple or red. 1912. Underprint Type 1 in purple.